Laminated Walnut back. European beech frame, brass detailing, new black leather upholstery. This pair of stunning side chairs with moulded walnut backs with black leather upholstery show influence from some of Italy’s foremost designers of the 20th century. Mollino, Buffa and of course Parisi. 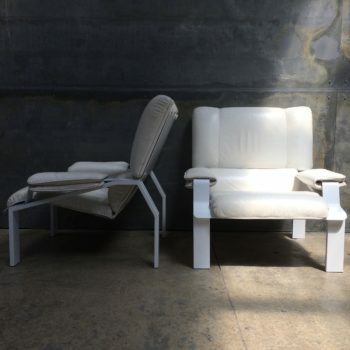 Ultra luxe pair of Italian velvet lounge chairs by Paolo Buffa Large 1960’s Californian Modern Abstract Painting.